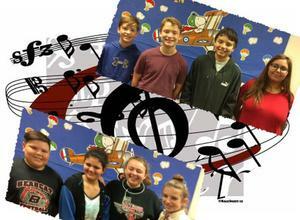 Eight Ballinger Junior High students took places in TMEA Region 6 All-Region Honor Choirs in two separate auditions. In TMEA Region 6 Middle School All-Region Choir auditions for seventh and eighth grade students, held Saturday, October 20, at Clack Middle School in Abilene, A. Segovia was named to the All-Region Treble Choir, and E. Busenlehner, O. Duke, and N. Holder were named to the All-Region Tenor-Bass Choir. The ladies placed in the top 25 students in their sections and the men placed in the top 15 in their section to qualify for their respective choirs. In TMEA Region 6 Sixth Grade Honor Choir auditions held Tuesday, October 30, at First Baptist Church in Abilene, J. Dankworth, C. J. Moreno, A. Quiroga, and O. Tucker were named to the Sixth Grade All-Region Honor Choir by placing in the top 35 students of those who auditioned in their sections. The seventh and eighth grade students will participate in the Junior High/Middle School All-Region Choir Clinic and Concerts, and the sixth grade students will participate in the Sixth Grade Honor Choir Clinic and Concert. The concerts will be held in the Clyde High School Auditorium Saturday, November 10, at 5:00 PM. There is no admission charge, and everyone is invited, in fact encouraged, to attend the concerts in support of these young people. “We are very proud of the achievements of each of these students and their service to the BJHS Choir,” stated Dale Ellis, choral director.